I think that it is important to re-read this post as a reminder to us all as tonight as our communities celebrate Halloween. I am guessing my neighborhood is all-too-typical in that people typically arrive home from work and immediately drive their cars into the garage. More often than not they do not emerge again until the next morning when they leave for work once more. We are private, reclusive people who delight in our privacy. We rarely see our neighbors and rarely communicate with them. . . . In the six years we have been living in this area, we have never once had a neighbor come to the door to ask for anything. . . . Yet on Halloween these barriers all come down. I have the opportunity to greet every person in the neighbourhood. I have the opportunity to introduce myself to the family who moved in just down the row a few weeks ago and to greet some other people I have not seen for weeks or months. At the same time, those people's children will come knocking on my door. We have two possible responses. We can turn the lights out and sit inside, seeking to shelter ourselves from the pagan influence of the little Harry Potters, Batmans and ballerinas, or we can greet them, gush over them, and make them feel welcome. We can prove ourselves to be the family who genuinely cares about our neighbours, or we can be the family who shows that we want to interact with them only on our terms. Most of our neighbors know of our faith and of our supposed concern for them. This is a chance to prove our love for them. 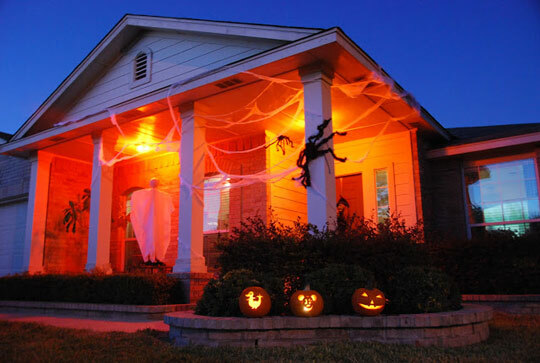 The same contributor to the email list concluded his defense of participating in Halloween with these words: "One night does not a neighbor make (and one night does not a pagan make), but Halloween is the one night of the year where the good neighborliness that flows from being in Christ is communicated and reinforced. We are citizens of another Kingdom where The Light is always on." The truth is that I have several convictions regarding Halloween. I despise the pagan aspects of it. I am convicted that my children should not dress as little devils or ghosts or monsters. But I am also convicted that there could be no worse witness to the neighbours than having a dark house, especially in a neighbourhood like ours which is small and where every person and every home is highly-visible. We know that, if we choose not to participate, the neighbors will notice and will smile knowingly, supposing that we feel too good to participate.
. . . Our door will be open and the light will be on. And we trust that the Light will shine brightly. My encouragement to you today is to think and pray about this issue. I do not see Halloween as a great evangelistic occasion. I do not foresee it as a time when the people coming to your door are likely to be saved. But I do think it is a time that you can prove to your neighbors that you care about them, that you care about their children, and that you are glad to be in this world and this culture, even if you are not of this world or this culture. Halloween may serve as a bridge to the hearts of those who live around you who so desperately need a Savior. Why Has My Congregation Stopped Singing? What Was The Purpose Of Jesus' Coming?